Nothing says Memorial Day like firing up your barbecue to cook some New York Strip Steaks. Here is a simple twist on a classic steak to help take it to the next level!! For the setup of the grill, I filled the chimney 2/3’s full with briquettes, roughly 65 -70 pieces. I placed the chimney over a lit paraffin wax cube and waited for the smoke to turn clear. Once clear, I dumped the chimney on the back 1/3 of the barbecue making sure the briquettes are touching each other. Close the lid and allow the barbecue to preheat. After 10-15 minutes, brush the grates clean. You are now ready to get cooking!! In a mixing bowl with a wooden spoon, cream the butter. Once the butter is light and fluffy, add cheese, garlic, salt, pepper and parsley. Mix well to combine. Add the breadcrumbs and mix until they have been incorporated. Use your hands to shape the butter and breadcrumb mixture into 6 pieces of ½ “ flat 2” wide x 8” long rectangles. Place each disk on a piece of wax paper and place in the refrigerator. Remove steaks from refrigerator and let sit at room temperature for 30 minutes. Season steaks evenly with kosher salt and coarse ground black pepper. Prepare the grill for direct high heat cooking (450° to 550°F). 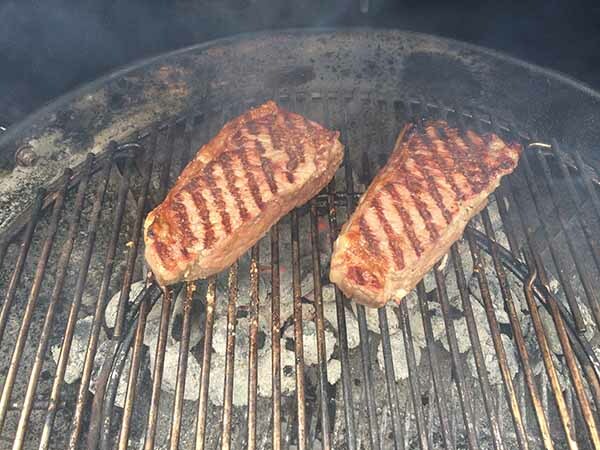 Grill the steaks over direct high heat with the lid closed for 2 1/2 minutes per side, or until sear marks have developed. Move the steaks to the indirect cooking part of your grill. Once the steaks are cooked to this point, remove the lid of your grill and place the refrigerated piece of parmesan crust on top of the steak and close the lid once again. Cook for another 6 minutes. Once the crust has browned, remove the steaks from the grill and serve warm.